Growing an avocado plant from a pit is a classic school project and is easy to do. Avocado trees love warmth and bear fruit, growing outdoors in mild climates or indoors in regions with colder winters. After you eat an avocado, you can rinse off the seed and try to grow your own plant from it. Avocado seeds sprout readily, making this a satisfying project in your home. You can sprout avocado pits two ways, either in water or by planting them directly into a soil mix. Insert two or three evenly-spaced toothpicks into the sides of the avocado pit, just deep enough so that the toothpicks are secure. Fill a small glass or jar with room-temperature water. Place the avocado pit with the pointed end facing up and the wider, flat end facing downward into the glass so that the toothpicks rest on the rim. Adjust the water level in the glass so that the bottom base of the avocado pit is just touching the water surface and no more than the bottom quarter of the pit is submerged. Set the glass with the avocado pit in a sunny window. Replace the water in the glass at least two or three times per week to provide fresh water and prevent mold from growing. Transplant the avocado pit into a 6-inch-diameter planter pot filled with sandy-loam potting or garden soil when leaves and roots begin to emerge. Plant the sprouted avocado seed into the potting soil so that the tip of the pit is just below the soil surface. Slice the avocado pit with a sharp razor blade or knife from one end of the seed to the other. Make the cut shallow and thin, less than 1/8 inch deep. Line the bottom of a 6- to 8-inch-diameter planter pot with gravel or a broken clay pot. Fill the rest of the pot with a mixture of one part vermiculite, one part humus (leaf mold) and two parts loamy garden soil. Plant the avocado pit with the tip (narrow end) facing up and the wider base pointing downward. Plant the pit into the soil mixture so that about two-thirds of the avocado seed is buried into the soil with the tip above the soil level. Water the potting mix generously to thoroughly moisten it. Secure a clear plastic bag over the container to regulate the temperature around the avocado pit and to keep the soil moist. Place the planter pot in bright light or full sunlight, and maintain air temperatures of 70 to 85 degrees Fahrenheit during the day and 50 to 65 degrees at night. Cover the avocado seed with 1 or 2 inches of humus after it sprouts, which can take one to three months. Water your avocado seedling frequently enough to keep the potting soil evenly moist but not wet or soggy. 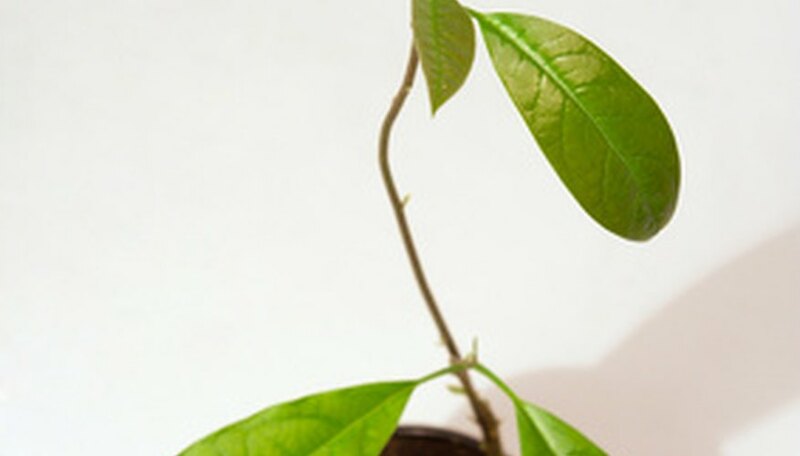 Feed the avocado plant once each month during spring and summer with an all-purpose, water-soluble houseplant fertilizer. You can set the plant outdoors in a sunny spot during the warmer summer months to provide it with sunlight and fresh air. Don't expect your indoor avocado plant to produce fruit. Even if you plant the sprouted avocado pit outdoors, it won't produce fruits of the same quality as the parent tree because the plant won't grow true from seed.